The above quote has absolutely nothing to do with what I am going to write. I just thought it was hilarious – I might be in need of a nap. Anyhow, this summer I decided to be a chicken farmer. A chicken egg farmer to be exact. Darrel, and for that matter many of my friends, have pointed out that poultry and sled dogs don’t mix. Little do they know, I have a plan. Actually I really don’t have a plan other than to fence the chickens in and hope they don’t get eaten but by saying I have a plan my husband is satisfied and I look s-m-r-t. The whole farming thing didn’t start off so well. I ordered chicks from a hatchery in Texas. They put them (25 peepers) in a box and ship them in the mail. It takes 48 to 72 hours for them to arrive which is fine because they have a yolk sac in their chests they live on. Anything longer than that is a problem though – keep that in mind for the rest of this adventure. 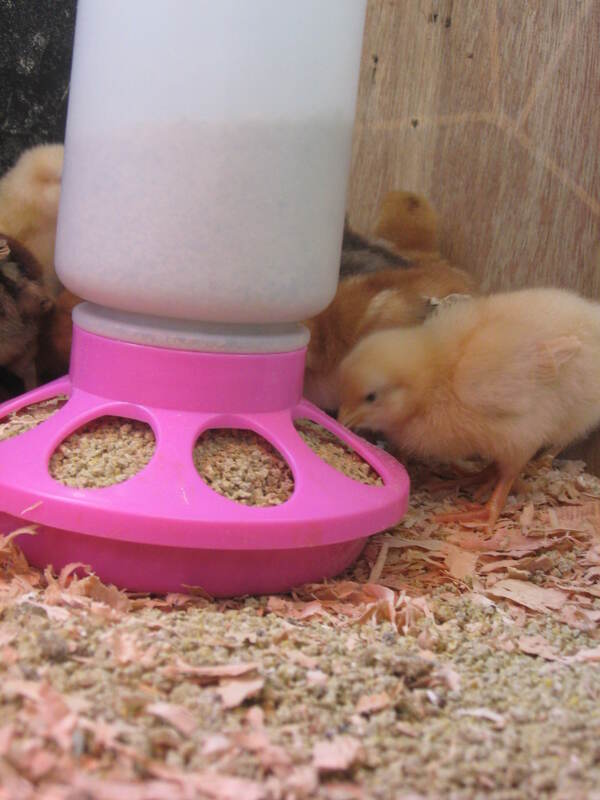 I figured since this batch is all girls they needed a pink feeder. Yeah, I’m lame. I received an email on a Tuesday from the hatchery informing me my chicks are on their way. Like any good mother I set up a warm brooder box with a red light heat lamp, plenty of shavings, a water and a food dispenser and a 10 lb bag of chick starter. And then I waited. And waited. And waited. By Thursday night there were no chicks in my brooder so I called the hatchery and left a message. On Friday I talked to the hatchery and there were still no chicks. Obsessively I checked my cell phone every five minutes hoping to see a message from the post office that my little birds have arrived and I can pick them up. Alas, nobody called. Saturday morning Darrel stood in plain view in our driveway, oh about 20 feet from the mail box. The USPS guy drove up and put a parcel delivery card into the box and drove away. What information was on that card? Why my chicks had arrived and I can pick them up at the post office on Monday. Huh? I phoned the contract post office at the end of our road and the lady told me that the chicks wouldn’t be there anyway because they don’t handle them. They would be at the post office in Fairbanks. Hmmmm, but the driver gave me a card which clearly stated the contract post office. So, I rushed out the driveway and tried to chase the postal carrier who I sincerely hopied was not armed with a pistol, taser or mace because I would come zipping up behind him and try to get him to stopped. I didn’t see him anywhere. Dejected, I drove back home. We called our good friend Hal who is the postmaster and after a bit of investigating he said the driver would take the chicks back to the post office in Fairbanks. Why he even took them on a 75 mile drive in the first place, if he wasn’t going to walk to our door, was beyond me. Jerome from the post office called back about an hour later with the good news that the chicks were there and the bad news that they had all died. And he inquired, “When can you come pick them up?” Again, huh? I informed Jerome I would be happy to pick them up about two weeks from never. Why would I drive 30 miles one way to pick up a box of dead chicks, toss them in the post office trash and then drive home? He told me because they were US mail he couldn’t throw them out. I politely told him he had my permission to do so and I was willing to bet that when they got ripe they would go in the trash. Sigh. I should have mentioned that my co-workers had a pool going on how long it was going to take me to kill chickens. They never imagined it would be before I got them! This is my favorite chicken on the left. Not to be deterred, I called the hatchery and they sent me another batch for free. This time they arrived healthy and sound. My dreams of fresh eggs were beginning to come true. That is until I found out that two-thirds of my hens are roosters. What I didn’t understand is that when one orders a “straight run” of chicks they get both sexes. Shouldn’t that be in print beside all the cute pictures? So now, come fall, we won’t have to buy roast chicken for a while. Don’t tell that to the feathered creatures in our coop – it only upsets them and I don’t want them losing any weight! We moved them outside last weekend. They have a fenced in area and a huge doghouse to roost in for the time being. 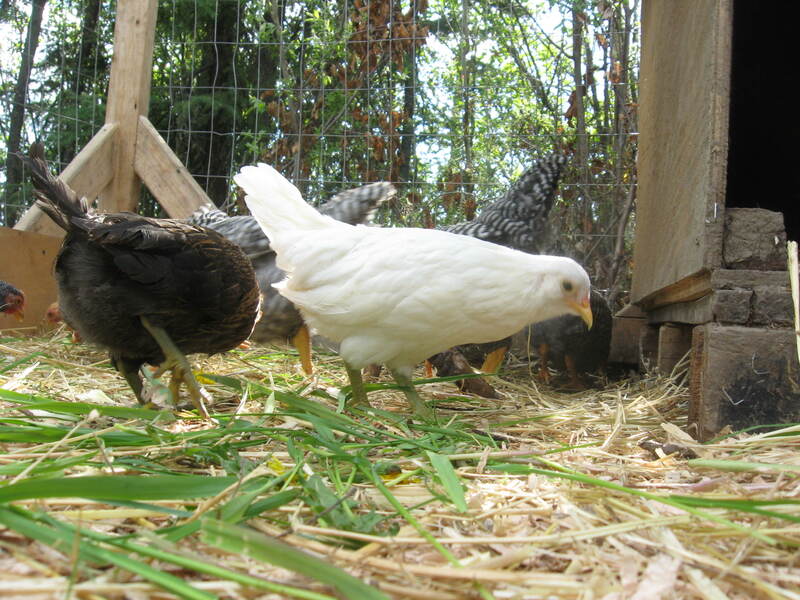 I am fussing and fretting about chicken coop plans so it might be a while before I make up my mind about a design. Probably about the time the first egg shows up. Despite my screw-up I am having a great time raising these birds. Out of the 25 I started with I still have 18 which has exceeded everyone’s expectations including my own! Now that they are coming onto 7 weeks old people have stopped asking if I have killed any more chicks. My little flock is growing and are a bit on the spoiled side. 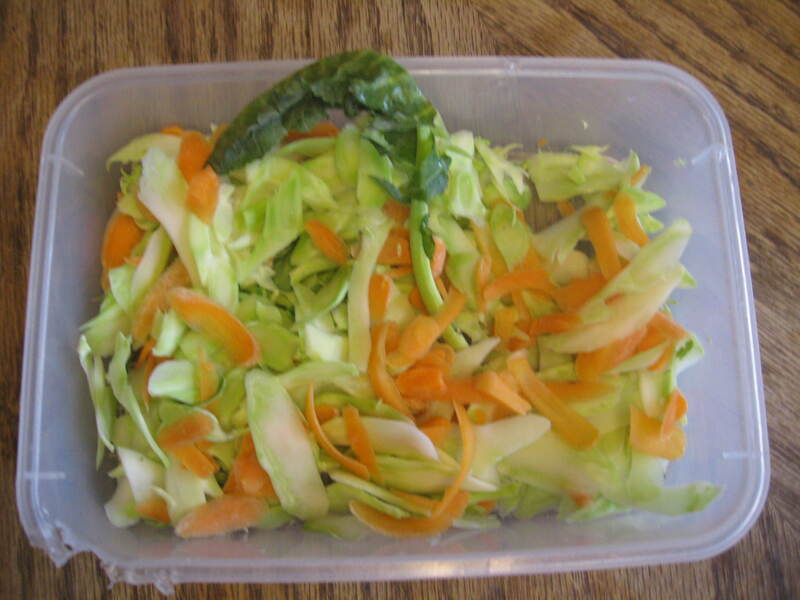 Agree with me….veggies look much better with the orange of the carrot mixed in! The other afternoon I had broccoli stems which I shaved into thin slices in a bowl for the chicks. It looked too green so I grabbed the carrots and mixed them in. That looked better. Of course the birds were more interested in pecking the mud off my pants and eating little bits of straw. Yesterday they got broccoli, carrots, fried potato remnants and grass. Yup, I may have a bit too much time on my hands right now. My original plan was to have a dozen or so hens so of course I needed to order more chicks. 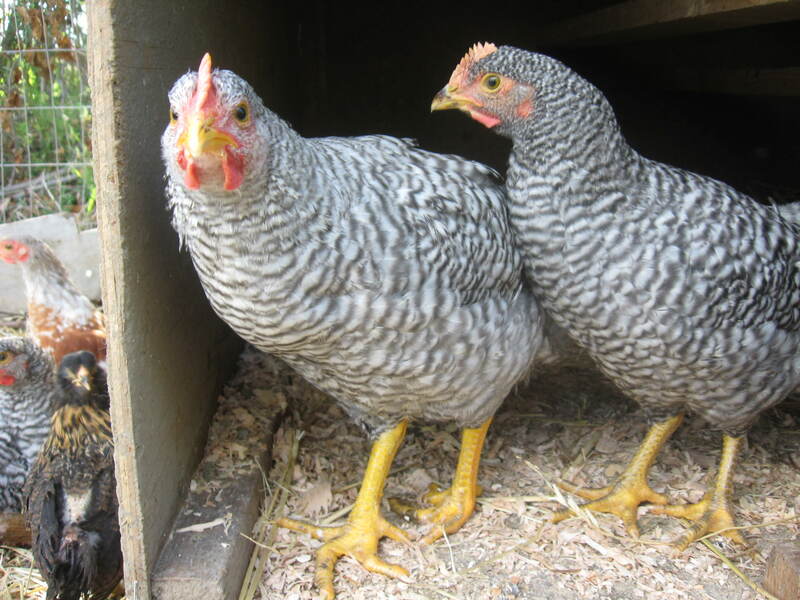 This time I was up on my poultry lingo and bought a bunch of “pullets” which are females. They were shipped last week on Wednesday and I picked them up on Friday afternoon. Here’s the little box they are shipped in. They need a small space to stay warm. Some lady in the post office line started yapping (honestly that’s what it sounded like) about how she couldn’t believe you could get chicks in the mail. Well why not – you can get a bride can’t you? Then she was bellyaching about the cruelty while I was showing the little peepers to a small girl, also in line, all the while trying to keep the very active birds from hopping out of the box. I told the “it’s-so-cruel” lady about the yolk sac thing and she at least shut up. This woman looked like she had just stepped out of the pages of a fashion magazine. Hair done. Manicured nails. Expensive clothes. Tapping on her iPhone. Yup, a long time Alaskan for sure. 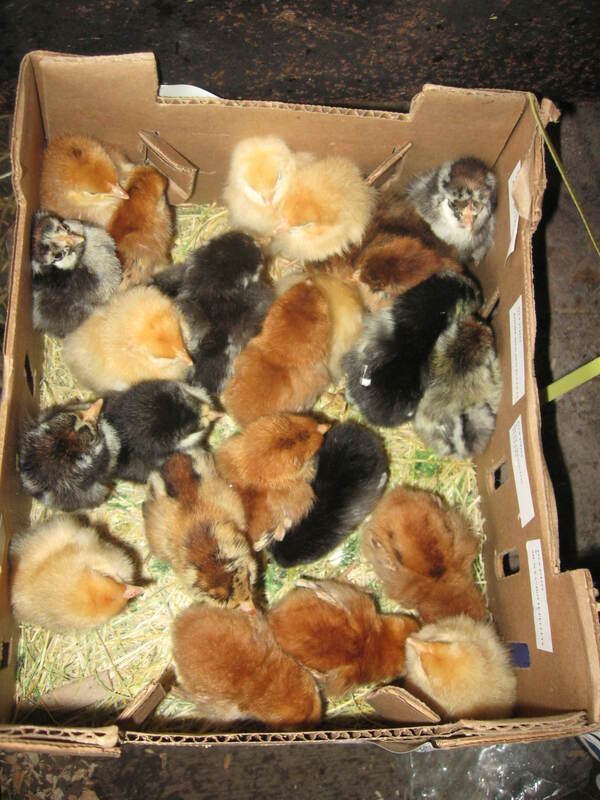 There I was in muddy Carhartts, muddier rubber boots, dog hair covered sweatshirt and a box full of chicks. I wonder if she would have fainted if I had just hugged her. Life is good here at Peg’s Poultry. 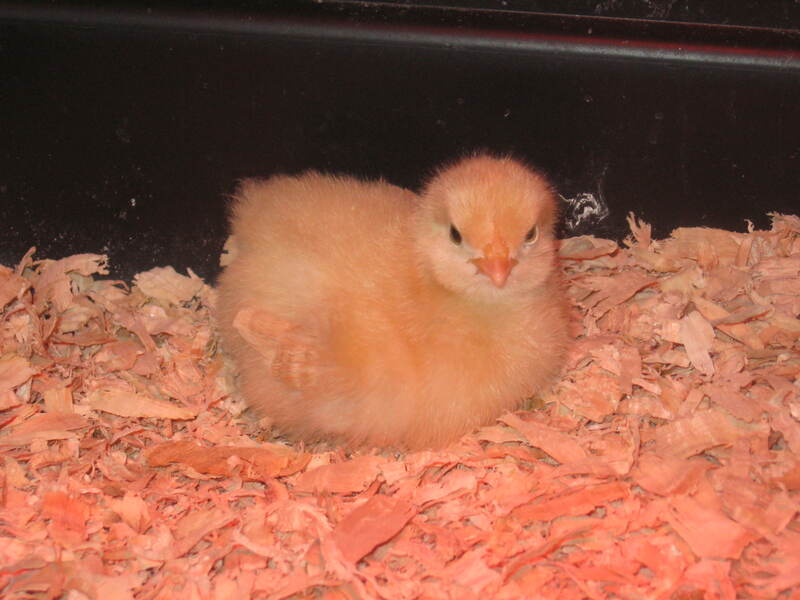 Big chicks are thriving outside and little peepers are healthy and happy in the brooder box. There will of course be many pictures of the first egg so brace yourself. P.S. I know this got posted twice – once on the home page and then again in the blog. I’m still trying to navigate WordPress but I have future blogs figured out and they will indeed land in The Blog section. Like I said, I am s-m-r-t. This entry was posted in The Blog and tagged egg farmer. Bookmark the permalink.